Decay in the mouth begins as a weakening of the tooth surface also known as demineralisation. This is a process that occurs when we have bacteria present that produce acid and this acid dissolves away the hard outer surface of the tooth (the enamel). The acid is produced whenever we eat or drink something sugary, so when sugar and acid producing bacteria are present together and for a prolonged period of time, enough enamel is dissolved to cause the white spot lesion – the start of decay. 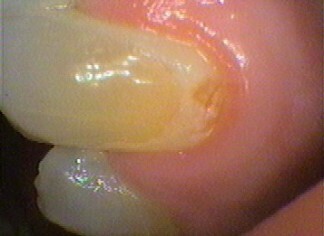 The mouth can overcome this demineralisation naturally with saliva. It contains minerals such as calcium and phosphate which can buffer against the acid attack by replacing minerals that are dissolved away. 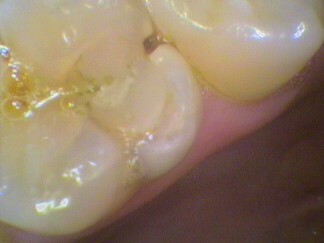 In this way, the enamel has a limited ability to “repair” itself. We also obtain minerals from sources such as fluoride from toothpaste and in tap water, so that every day, our teeth go through a tug of war between demineralisation (losing minerals) and remineralisation (gaining minerals). 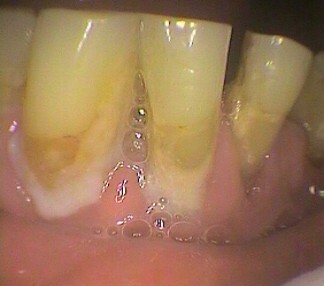 This is why it is possible to prevent early white spots of decay from forming a cavity by favouring remineralisation, for example by applying extra strong fluoride after a professional clean by your dentist and maintaining this with good home care. The cavity forms when the balance of gaining minerals is not great enough to overcome the loss of minerals.